The ultimate turning point! 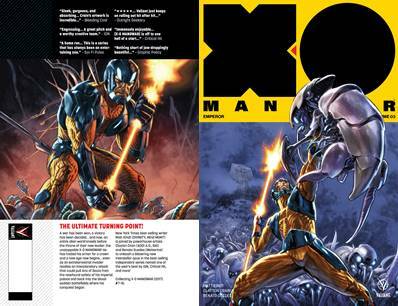 A war has been won, a victory has been decided... and now, an entire alien world kneels before the throne of their new leader: the unstoppable X-O MANOWAR! He has traded his armor for a crown and a new age now begins... even as an extraterrestrial invader readies an interplanetary attack that could pull Aric of Dacia from the newfound safety of his imperial palace and back into the blood-sodden battlefields where his conquest began. Comics superstar Clayton Crain (4001 A.D., RAI) joins New York Times best-selling writer Matt Kindt (RAPTURE, Mind MGMT) to summit the next pinnacle of 2017's best-selling independent superhero series - and unleash a blistering, new interstellar opus chronicling the most powerful moment yet in the history of Valiant's unrelenting icon! Collecting X-O MANOWAR (2017) #7 - 10.